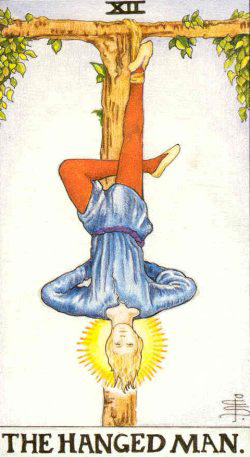 The Hanged Man is the twelfth Major Arcana, depicting a man hanging upside-down by one foot. The serene, even enthusiast expression on his face indicates that this has a deeper signification than a „ pittura infamante“ – the defaming portraits, common in Renaissance Italy, depicting traitors and thieves being punished in that manner. Here, the tree of sacrifice has a different meaning, like the cross of Christ in Christianity. 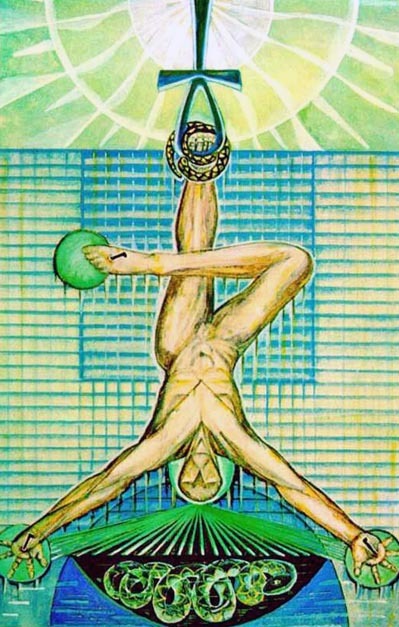 According to A. E. Waite, the divinatory meaning of the Hanged Man is expressed by the following words: „wisdom, circumspection, discernment, trials, sacrifice, intuition, divination, prophecy “. 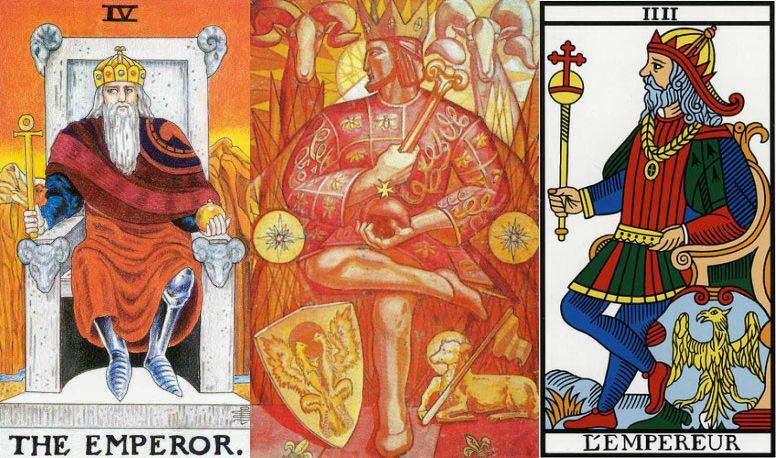 Reversed, the Hermit can signify, according to the British author of „Pictorial Key to the Tarot“: „Selfishness, the crowd, body politic“. that the figure, as a whole, suggests life in suspension, but life and not death. The author himself is not very expressive: „I will say very simply on my own part that it expresses the relation, in one of its aspects, between the Divine and the Universe“. „This is a man who saw Truth. Suffering awaits the man on earth, who finds the way to eternity and to the understanding of the Endless. He is still a man, but he already knows much of what is inaccessible even to Gods. And the incommensurableness of the small and the great in his soul constitutes his pain and his golgotha. In his own soul appears the gallows on which he hangs in suffering, feeling that he is indeed inverted. He chose this way himself. For this he went over a long road from trial to trial, from initiation to initiation, through failures and falls. And now he has found Truth and knows himself. He knows that it is he who stands before an altar with magic symbols, and reaches from earth to heaven; that he also walks on a dusty road under a scorching sun to a precipice where a crocodile awaits him; that he dwells with his mate in paradise under the shadow of a blessing genius; that he is chained to a black cube under the shadow of deceit; that he stands as a victor for a moment in an illusionary chariot drawn by sphinxes; and that with a lantern in bright sunshine, he seeks for Truth in a desert. Now he has found Her“. „It would perhaps be better to say that it represents the spiritual function of water in the economy of initiation; it is a baptism which is also a death“. „In the Aeon of Osiris, this card represented the supreme formula of adeptship; for the figure of the drowned or hanged man has its own special meaning. The legs are crossed so that the right leg forms a right angle with the left leg, and the arms are stretched out at an angle of 60&deg; so as to form an equilateral triangle; this gives the symbol of the Triangle surmounted by the Cross, which represents the descent of the light into the darkness in order to re deem it. It is notable that there is an apparent increase of darkness and solidity in proportion as the redeeming element manifests itself; but the colour of green is the colour of Venus, of the hope that lies in love. That depends upon the formulation of the Rose and Cross, of the annihilation of the self in the Beloved, the condition of progress. In this inferior darkness of death, the serpent of new life begins to stir“. 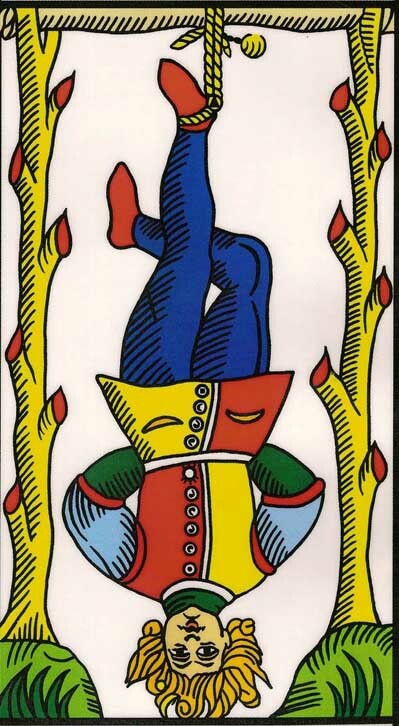 Papus thinks that „This Hanged Man serves for an example to the presumptuous, and his position indicates discipline, the absolute submission which the human owes to the Divine. 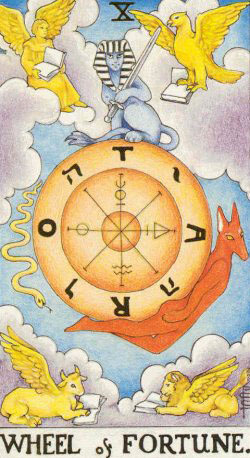 Equilibrium of the potential Manifestation (10 – Wheel of Fortune), and of reflected Life (11 – Strength) – Reflex of the astral Fluid – EQUILIBRIST FORCE. 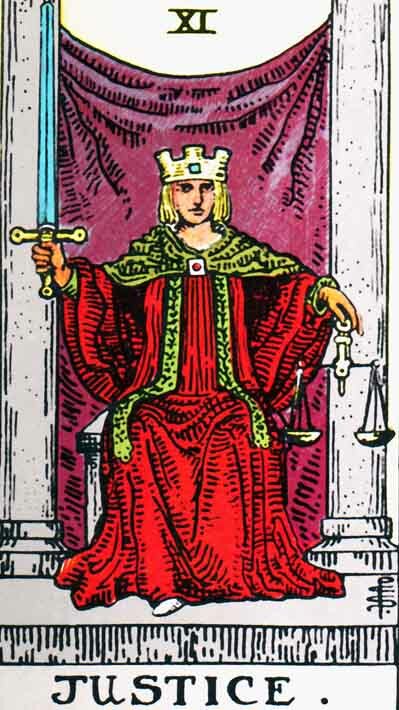 Share the post "The Hanged Man – Major Arcana Tarot Card Meaning, according to Waite, Ouspensky, Crowley and Papus"